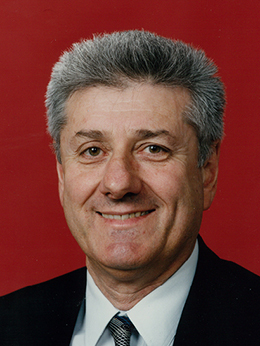 Within two years of entering the Senate in 1981, Bruce Childs was a co-convener of the left-wing of Labor's federal parliamentary party and the ALP throughout Australia, retaining that role throughout the period of Hawke and Keating Labor governments. Acknowledged as a unifier by his left-wing colleagues, he was recognised by senators from all sides of politics for his courteous, patient and unpretentious manner, as much as he was for the strength of his beliefs. Bruce Kenneth Childs was born at Mascot, Sydney, on 23 August 1934, the eldest of two sons of Ernest Frederick Childs and his wife Elizabeth Maud (Millie), née Cowdrey. His father was a carriage-maker who was ruined in the Great Depression and turned his hand to baking. Shortly after Bruce was born, the family moved to Earlwood, where he attended the local public school before continuing at Sydney Technical High School, then a selective high school in Paddington. After leaving school, he served a printing apprenticeship in etching. Childs attributed his early interest in politics to listening to radio broadcasts of Parliament. His heroes were Ben Chifley, Dr Bert Evatt and the fiery Member for East Sydney, Eddie Ward. Childs entered politics through the trade union movement. He first came to prominence at a meeting of apprentices convened by the Amalgamated Printing Trades Employees' Union of Australia (APTEUA). When the officials asked the apprentices to raise any problems that they were encountering, the seventeen-year-old radio fan broke the uncomfortable silence by moving a resolution against the 1951 'horror budget' that had just been brought down by the federal Treasurer, Arthur Fadden. Childs was invited to attend the union's board of management as an observer and was placed under the leadership's wing. He joined the ALP, became clerk of the chapel (his shop committee), and led his first strike in 1953. He was elected to the board of management representing his trade in 1954, at the age of nineteen. His first meeting of the NSW Labor Council supplied a lifelong touchstone: 'That's the leadership up there', advised the older officials in his delegation, pointing to the presidium, 'if you have any doubts on an issue, always vote against the bastards'. Attending his first state conference of the ALP in 1954, Childs came of political age at the height of the Cold War, and on the eve of the great Labor Split of 1955. The printers' union was aligned with the left-wing of the party; Childs had already met rising left leaders such as John Garland and Arthur Gietzelt in union and Young Labor circles, and he found his political home within Labor's socialist currents. On 3 September 1955 he married a fellow political activist, Winifred (Win) Bradley, then a medical student and later a psychiatrist; they had a son and daughter. Bruce and Win Childs separated in 1986 and were amicably divorced three years later. On 19 May 1989 Bruce Childs married Judith Anne Larkin, who died in 1995. In 1997 he married Yola Lucire, a forensic psychiatrist; they settled in Edgecliff, NSW. Upon completing his apprenticeship, Childs worked for the Fairfax newspapers and settled in Ultimo. Already a vice-president of his union, he became a full-time organiser in 1957, assistant federal secretary in 1964, and state secretary in 1965. When the APTEUA amalgamated with the Printing Employees Union of Australia to become the Printing and Kindred Industries Union (PKIU), Childs served as joint secretary of the PKIU's NSW branch, and as federal vice-president from 1966 to 1971. In addition to his union duties, Childs was engaged by the political issues of the era, particularly in opposing Australia's involvement in the Vietnam War, and supporting the women's liberation movement, including a greater appreciation of the role of women within the ALP. As the convenor of the Nuclear Disarmament Co-ordinating Committee, he was proud of his role in convening Palm Sunday peace marches for at least ten years from 1982, and occasionally thereafter. At its peak in 1985, the march brought some 170 000 citizens into the streets of Sydney. A decade later Childs played a leading role in a protest visit to Tahiti by Australian parliamentarians opposed to French nuclear tests in the Pacific. The platform for Childs' entry to the Senate was his election as assistant general secretary of the New South Wales branch of the ALP in 1971. A raft of changes initiated by the ALP Federal Executive to enhance representation within the right-dominated branch included the introduction of proportional voting for delegate and administrative positions, giving the left faction its first salaried executive position at the ALP office in Sussex Street. John Faulkner (ALP, NSW), who followed Childs into Sussex Street and then joined him in the Senate, recalled the slights, snubs, humiliations and isolation that came with the job of being the sole representative of the left in the pioneering days of power-sharing at 'head office'. 'I have always thought', Faulkner said on Childs's retirement, 'that, if you serve a 10-year sentence in Sussex Street, you deserve a seat in the Senate'. Placed second on Labor's NSW Senate ticket at the election of October 1980, Childs was the third senator elected and took his seat in July 1981. He was re-elected in 1983, 1984, 1987, 1990 and 1996. Childs was not especially prominent in the chamber. He asked questions frequently and spoke occasionally, mainly on industrial relations, economic issues, social welfare, human rights and nuclear disarmament. He was an effective and well-respected temporary chairman of committees from 1983. Childs' principal contribution to Parliament was made through his highly effective service on many committees. As chair of the Standing Committee on Industry, Science and Technology (from 1993 including transport, communications and infrastructure) from 1987 to 1994, and of the Economics Legislation Committee (1994–96), he presided over major inquiries into reducing the impact of greenhouse gases, fisheries administration, tariffs, and trade agreements. Childs was a member of the Committee of Privileges for fourteen years, and was chairman from 1984 to 1987. In 1993 he said that the 'vast majority' of cases heard by the committee were not about protecting the privileges of senators, rather, they involved 'the right of ordinary Australians to reply to statements made in the parliament', and 'the right of parliament to protect its own witnesses'. Childs also chaired Estimates Committee C (1985–87), Estimates Committee A (1987–94), and the Select Committee on the Victorian Casino Inquiry (1996–97). In 1992 Childs delivered a paper titled 'The Truth About Parliamentary Committees', which gave a thoughtful assessment of the role of Parliament and of the Senate, and suggested ways in which the legislative process might be improved. He observed that the rivalry between the two Houses 'permeates every level of this building' and sometimes prevents the application of practical solutions, such as rationalising parliamentary committees over both chambers. He questioned the notion that the longer terms of senators allowed them more time for contemplation, pointing out that he had faced five elections and was yet to complete a full six-year term because of double dissolutions. He also ridiculed the suggestion that senators were 'more noble, and independent of all the crass political pressures' that besiege the House of Representatives: 'The simple truth is that the Senate is dominated by people who have come into this place by virtue of their prominence in the state party machines'. Childs observed that the proliferation of Senate committees meant that 'the workload is out of hand', resulting in a decline in the degree of involvement by senators and in the quality of their work. Characterising Senate committees as having 'all the psychodynamics of a small group without the therapy', Childs claimed that too many senators were 'token members of committees', and he attacked what he called the 'primitive personalities', such as the senator who 'always pushed in to ask questions' and then left to make phone calls for the next hour before returning to push in again. In estimates committees, he noticed that 'it is those senators that want to save the taxpayers' money who want the biggest audience of public servants at midnight, watching them perform'. He suggested that merging the roles of estimates and standing committees would 'develop a corporate memory in each committee', and make both more effective. This idea was implemented in the redesign of Senate committees in 1994. Childs was amazed that despite all the political differences between senators 'for most of the time and on most committees, you have a civil and productive result'. He gave the example of a committee report which he and his sole Labor colleague, Senator John Coates, regarded as unacceptable: 'We got down into the trenches and fought every sentence and every paragraph'. Finally, Liberal Senator Reg Withers proposed that the report be reduced to twenty pages, with everything else consigned to an appendix. From this point 'everybody agreed' and 'we finally got a report that I think was quite a good one'. Childs also recalled a package of bills to restructure the regulation of the fishing industry, which had a tortuous development in the relevant department, with the delay causing anger within the industry. The bills were eventually rushed through Caucus, and arrived before the Senate Standing Committee on Industry, Science and Technology, where the work of Childs and his colleagues resulted in eighty government amendments to bring the measures into proper shape. In Childs' view, 'an alarming amount of unsatisfactory legislation gets through the system', and usually because the government has failed to realise 'the broad political implications' of the relevant legislation. On occasions Childs was prepared to speak publicly on divisions between the ALP's left and right. On 22 August 1986 Childs, and his fellow left convenor Gerry Hand MP, issued a press release stating that the Hawke Government's decision to sell uranium to France exemplified its 'failure to implement the party platform'. In January 1991 Childs, together with senators Margaret Reynolds and John Coates, abstained from voting on a motion of support for Australia's involvement in the Gulf War (in the House of Representatives the motion passed on the voices after seven Labor members absented themselves). The dissidents were subsequently censured by the ALP National Executive. More severe action, perhaps suspension from the party, would have been taken had there been a division in the House, as there was in the Senate, and the absence of the seven had thereby been recorded. In December of the same year, Childs publicly warned Prime Minister Hawke that the left was dissatisfied with the government's performance. Hawke lost the leadership to Paul Keating ten days later. In 1995 Childs was put under heavy pressure to retire at the next election in favour of union leader George Campbell, with Prime Minister Keating intervening in support of Campbell. Childs resisted, and seventy-one prominent ALP women signed a letter to the ALP left caucus supporting him. A divisive preselection contest was averted when Childs agreed to stand down during his next term. He resigned from the Senate on 10 September 1997, and was succeeded by Campbell. After leaving the Senate, Childs served as president of the Evatt Foundation (1997–2006). The valedictory speeches for Childs were noticeably warm across party lines. Australian Democrats Senator Vicki Bourne considered Childs to be 'a genuinely good man' and 'absolutely trustworthy', while Liberal Senate leader Robert Hill (SA) described him as 'straight, fair, decent and very committed to his beliefs'. Several speakers drew attention to Childs' ability to conciliate and his exemplary capacity as a committee chairman. Liberal Senator John Watson (Tas.) noted that: 'Senator Childs has always made a habit of fully consulting with his colleagues on committee work. I have found this to be a special skill, and his effectiveness in this area is particularly praiseworthy.' Labor's Senator Jim McKiernan said that he 'learned a tremendous amount' from Childs 'on how committees should operate and how you should relate to your colleagues on these committees'. Childs' ability in this regard was remembered long after his departure from the Senate. In June 2011 Liberal Senator Alan Ferguson (SA) recalled that Childs showed him how committees should work: 'how you could work together cooperatively to get a result which is in the interest of Australia; how you could make sure that your inquiries were not political inquiries but something that both sides of the chamber could have input into'. Writing in 1994, Tom Uren, the member for Reid in the House of Representatives from 1958 to 1990 and a leader of the Left in Caucus, paid tribute to Childs as 'a patient negotiator and an outstanding administrator ... He is one of the most outstanding collectivists I have known ... He does not push his own barrow, he always puts the interests of the Left and the working class first'. In his last speech to the Senate, Childs said: 'I have never identified with being a politician, but I really do identify with being a parliamentarian'. He believed that a 'strong parliament' was needed as a countervailing force to limit the 'unintended consequences', and 'foul-ups and muck-ups' which were a constant aspect of executive government. As an advocate for the working class, he never assumed it to be homogeneous. His fascination with the varieties of humankind was also a hallmark of his interest in the Senate. 'A textbook on Senate committees naturally fails to pick up the vast differences between individuals, even of the same party', he remarked in a 1992 lecture. Childs thought the Labor women's committee and its annual conference were the party's 'most dynamic and democratic organs' and he attended the women's conference as an observer for some twenty-five years. In his retirement, he turned his inexhaustible patience to reconvening the Palm Sunday committee in opposition to Australia's involvement in the Iraq war, building a coalition between groups as diverse as Catholic, Jewish, Muslim and Buddhist clergy on the one side and student unions, the Greens, the Communist Party and Trotskyite sects on the other. As a parliamentarian and a leader of the left, Childs saw his job as nourishing democracy, whether by finding ways that 'grassroots democracy in all its diversity can find a voice in the Parliament', or by ensuring that the leaders heard the currents rising from debate within his faction, or by perpetually encouraging young people and especially young women to become active in public life. This entry draws throughout on biographical notes prepared for the author by Bruce Childs in October 2010 [Biographical notes]. Biographical notes; CPD, 9 Sept. 1981, pp. 601–4; Amalgamated Printing Trades Union Review, May 1964, p. 4, July 1965, p. 4; 'Profile: Senator Bruce Childs', House Magazine, 4 Sept. 1984, p. 3; No to Nuclear War: A Decade of Sydney's Palm Sunday Marches and Rallies, Nuclear Disarmament Coordinating Committee, Syd., 1991; CPD, 21 Aug. 1996, p. 2783. Andrew Leigh, 'Factions and fractions: a case study of power politics in the Australian Labor Party', Australian Journal of Political Science, Vol. 35, No. 3, Nov. 2000, pp. 427–48; CPD, 4 Sept. 1997, p. 6511, 21 Oct. 1993, p. 2393. Senator Bruce Childs, 'The truth about parliamentary committees', Papers on Parliament, No. 18, Dec. 1992, pp. 37–51. Press Release, Gerry Hand & Senator Bruce Childs, 22 Aug. 1986; CT, 9 Dec. 1991, p. 1; CPD, 22 Jan. 1991, pp. 237–41; Senate, Journals, 22–23 Jan. 1991, p. 707; Leigh, 'Factions and fractions', p. 441; SMH, 26 May 1995, p. 2; CT, 27 May 1995, p. 13. CPD, 4 Sept. 6512–28, 21 June 2011, p. 3425; Tom Uren, Straight Left, Random House Australia, Milsons Point, NSW, 1994, pp. 370–1. SMH (Good Weekend), 8 Dec. 1990, pp. 57–64; CPD, 4 Sept. 1997, p. 6528; Biographical Notes; Childs, 'The truth about parliamentary committees', p. 37; SMH, 5 April 2003, p. 53. This biography was first published in The Biographical Dictionary of the Australian Senate, Vol. 4, 1983-2002, Department of the Senate, Canberra, 2017, pp. 66-70.